One of the more popular media memes of this election cycle is that we have "two historically unpopular candidates." This meme simultaneously reflects the media’s obsession with “balance” (mistaking it for objectivity) and obscures how much Republican Donald Trump’s presidential campaign is a historical aberration, as well as the deeper problems that his candidacy embodies or symbolizes. In the cable news universe, no one invokes the meme more often than Trump supporters and surrogates. There are at least three main problems with this meme. First, it’s a recent snapshot view, which clearly reverses cause and effect. Running for president has severely eroded Hillary Clinton’s popularity, due to the combination of intense political polarization and partisanship. On the other hand, becoming first the Republican front-runner and then the nominee has elevated Trump, bringing him in early September to his highest-ever level of national popularity. Second, it ignores how popular Clinton was as secretary of state — much more popular than Vice President Joe Biden, her only “credible” competitor in elite circles at the time. Third, Clinton is not unpopular with nonwhite voters: African-Americans, Latinos and Asian-Americans all have favorable views of her, at least in broad strokes. The meme thus obscures the racialized nature of Trump's and Clinton’s respective popularity problems. As a public servant before this election cycle, Hillary Clinton registered broad public approval. From April 2010 through May 2011, her approval rating averaged more than 60 percent, as aggregated by HuffPost Pollster. Her disapproval rating was never above 35 percent. In fact, throughout her tenure in President Barack Obama’s cabinet, her negatives remained below that level, while her positive numbers never fell below 56 percent. Her popularity was both high and steady, especially compared with Obama’s sharp drop-off early in his first term as president, as he faced increasingly intransigent GOP opposition. In a telling snapshot, an NBC/Wall Street Journal poll as Clinton left secretary of state post in January 2013 found her approval rating at 69 percent, “higher than any other outgoing secretary of state measured in a survey since 1948 — with one exception: Colin Powell, whose approval rating was at 77 percent per a late 2004 Fox News/Opinion Dynamics poll.” That’s hardly the sign of an unpopular political figure. Unsurprisingly, 92 percent of Democrats approved of Clinton's performance — but so did 64 percent of registered independents and even 41 percent of Republicans. Although most Republican strategists would not go on the record disparaging the party's chances, in private conversations with Business Insider, many savvy GOP insiders conceded that any Republican nominee would face an uphill battle against the former Secretary of State. "If she runs, it'll be almost impossible, I fear," one Washington-based Republican strategist told Business Insider. The story went on to cite a Quinnipiac survey that found Clinton leading both Jeb Bush and Marco Rubio in Florida by 11 points, aided by a 62 percent favorability rating in the state. 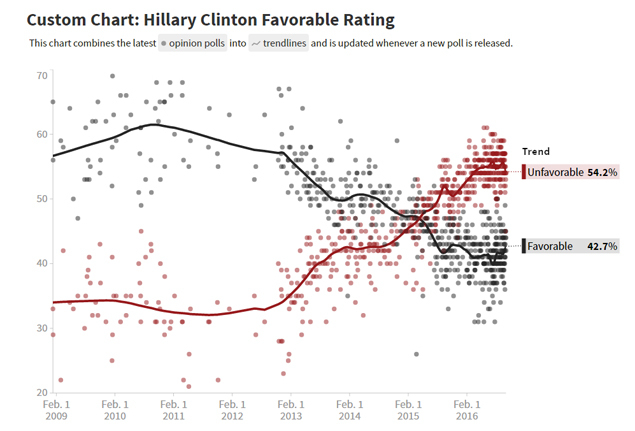 Clearly, Clinton was not unpopular four years ago. Indeed the Republican's main task was to erode her popularity in advance, using every trick at their disposal. Simply calling her “unpopular” without that history naturalizes the label, as if it describes something inherent to her nature — which is exactly what her political foes have intended all along. But the chart above tells a very different story: She has taken on an unpopular role, and — contrary to the meme — any other politician in the same role would also almost certainly be seen now as “historically unpopular,” a point we can revisit below by comparing her with Biden. 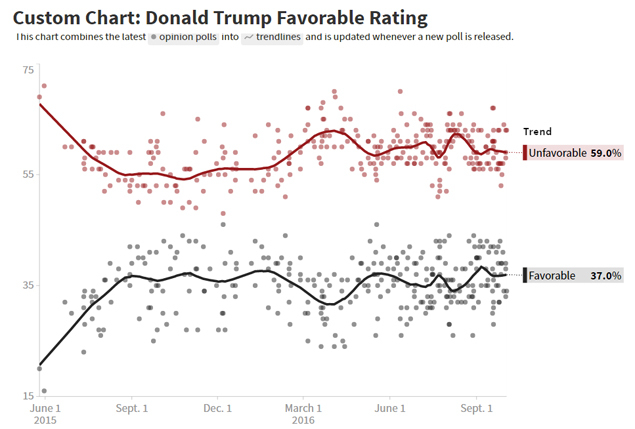 In early September, Trump peaked at a favorable rating of 38.4 percent favorable, but he came close to that a full year earlier, at 37 percent in August 2015. Although pundits were universally mistaken to think Trump couldn’t win the Republican nomination, they were right to think he had a ceiling of sorts: The proportion of voters who approve of him has been dramatically smaller all along than what’s needed to win a national election. Which is why demonizing Clinton has been so central to Trump’s campaign strategy: If he can’t raise his ceiling, he has to lower Clinton’s floor. And the “two historically unpopular candidates” meme helps him do that, by creating a media-friendly false equivalency. One excellent way to cut through this meme is to compare Clinton with Biden, a perennial favorite of the punditocracy and someone who has never fared that well at the ballot box outside his home state of Delaware. 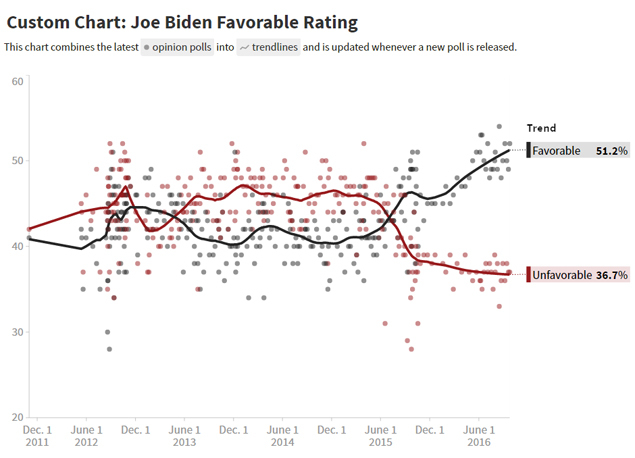 Biden’s popularity today is just below Obama’s, which suggests that he would been a far stronger candidate. But the record paints a different picture — that of a man whose popularity improved only as his likelihood of running for president disappeared. It’s impossible to say for certain what would have happened if Biden had run. But there is nothing in the data to support the notion that he is inherently more popular than Clinton. He’s more popular now at the moment, when all the fire is focused on her, and he gets nothing but glowing, folksy tributes. But that’s not a realistic barometer of what he’d be like if he were in her shoes. In fact, Biden never had approval levels as high as Clinton’s, so he’d be at least as vulnerable to a severe downward trend. What about Sen. Bernie Sanders? Well, that’s another story — and that’s my point. A lot of what Clinton faces right now, beyond the onslaught of Republican attacks, reflects a widespread rejection of the political status quo. Sanders would not be vulnerable to that, but virtually any other Democratic candidate would be. Clinton’s lack of popularity on this score has nothing to do with being one of "two historically unpopular candidates." It’s about loss of faith in the system as a whole, which is a subject the media wants to avoid with the “two historically unpopular candidates” meme. Clinton’s unfavorability is driven mostly by White voters: Black, Hispanic, and Asian voters all give her net positive ratings. Trump, on the other hand, does not get a net positive rating among any racial group, even Whites. In short, Clinton is only unpopular with whites, more unpopular than Trump by a good margin, in fact. So the meme is also a way of cloaking unacknowledged racial animus, a sentiment that Bill Clinton famously co-opted with his "Sister Souljah moment,” but that Hillary apparently can’t avoid. Her favorability ratings improve with age among Black voters as well: the majority of Black voters 65 and older have a “strongly favorable” opinion of her (55 percent), while only 35 percent of those under 35 do. The Clintons have a long but not uncontroversial history of support from the Black community, and it could be that older Black voters are more likely to have positive memories of Bill Clinton’s presidency, while younger voters may focus more on problems with his legacy since then. This brings us to a final point: Not only is it misleading to think of “popularity” without considering race; it’s also misleading to think of race alone. People are more complex than that, both individually and in social groups. Which is why pollsters and political scientists try to understand demographic groups. And here we find yet another way in which Trump’s unpopularity truly stands out as different and distinctive. In May, Gallup interviewed more than 11,600 Americans, at which time Clinton had a 40 percent to 33 percent advantage in favorability rating — figures not dissimilar to those in more recent polls. On May 27, Frank Newport reported on the demographic breakdown behind those broad numbers. As for Trump, he had 50 percent approval or more in exactly zero demographic groups. His best showings were 49 percent among males over 50, households that included military veterans and white males. He had above 40 percent approval, Clinton’s overall average, with just four other groups. It is worth looking at these differences in detail. They help us understand the dramatically different ways in which the two presumptive major party nominees are viewed across segments of U.S. society today. And that in turn helps us understand just how differently this election context can appear from one group of Americans to the other. The purpose of the press in a democracy is to help make a society legible to itself — the whole to its parts and the parts to its whole. The more diverse a society becomes, the more vital this purpose. When different parts see things so differently, suppressing the differences rather than exploring them only serves to make things even more confusing — which is the exact opposite of what we’re supposed to do as journalists. That happens far too frequently today. The notion that this election features “two historically unpopular candidates” is just one important example, serving to conceal the complex dynamics that are driving us apart as a society. It would be far better to try to understand those dynamics, so we can work together to rebuild the foundations of social trust. Do that, and the popular candidates will surely follow.